ABLS will host Huayen offerings to Buddhas and celestial beings Dharma event and Chinese New Year Cundī blessing service from February 10th, 2019 (Sunday) through February 17th, 2019 (Sunday). 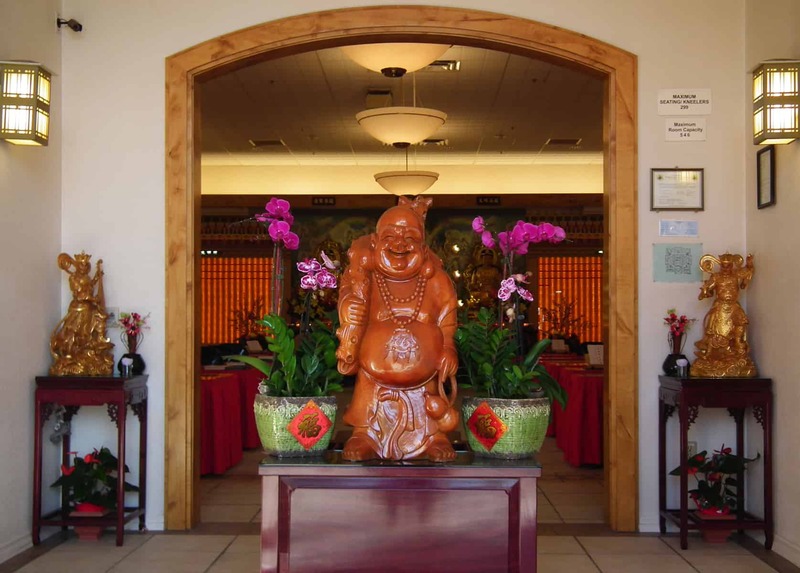 On February 10th starting at 9 AM, there will be Huayen offerings to Buddhas and celestial beings ceremony and Chinese New Year prayer service. The afternoon session will include Medicine Buddha honoring service, Eighty-Eight Buddha Repentance and Meng Shan Food Bestowal Ceremony. On each day from February 11th (Monday) through February 16th (Saturday), the assembly will chant the Cundī Sutra and Cundī Mantra (Incantation) from 4 to 5:30 PM. On the last day of February 17th starting at 9 AM, the congregation will practice the Cundī Repentance and Cundī Mantra in the morning; Cundī Sutra, Eighty-Eight Buddha Repentance and Meng Shan Food Bestowal Ceremony in the afternoon. Through the practice of repentance and mantra chanting, we can cleanse impurities of our minds while reflecting on Cundī Bodhisattva’s wisdom and compassion. Joining in this service will be a great way of starting a new year of Buddhist practice. All is welcome to participate. ABLS will celebrate Avalokiteshvara (Guan Yin) Bodhisattva’s Birthday on March 24th, 2019 (Sunday). Starting at 9 AM, there will be Buddha honoring service, followed by the assembly chanting the Avalokiteshvara Mantra (incantation), the Heart Sutra and the Universal Gate Sutra. Then Abbess Tian Cheng will introduce the doctrine and practice of Avalokiteshvara. Food offering for blessings will be conducted at noon. Starting again at 1:30 PM, participants will chant the Cundī Sutra and Cundī Mantra. For the evening session, there will be Eighty-Eight Buddha Repentance and Meng Shan Food Bestowal Ceremony. All are invited to pray for Guan Yin’s blessings, and the merits will be dedicated to all attendees for happiness and wisdom. To download application forms, please visit http://www.huayenusa.org/intro-abls/app-forms . For more details, please contact the office at (408) 942-0874.